Bajaj Allianz Personal Accident Plan is a Health Insurance Plan that ensures total security and peace of mind. The Accidental death or injury of a breadwinner can create financial problems for the family. Bajaj Allianz Personal Accident health policy provides security for your family for the future. Self, Spouse and Dependent children can be covered under Bajaj Allianz Personal Accident Health Insurance plan. 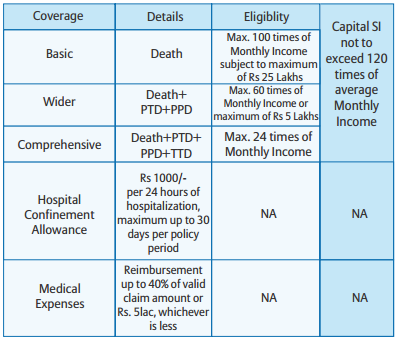 Benefits on death, Permanent Total Disability (PTD), Permanent Partial Disability (PPD), Temporary Total Diability (TTD), etc., are available under Bajaj Allianz Personal Accident Health Policy. Policyholder do not have to fill the Proposal Form again at the time of renewal in case he/she renew the policy before renewal date or within the grace period of 30 days. Free Look Period: If you are not satisfied with the Bajaj Allianz Personal Accident Health Insurance policy, you can cancel the policy within 15 days of receipt of the policy documents, provided there has been no claim. Portability: If you are insured under any other health insurance policy of Non life insurer you can transfer to Bajaj Allianz Personal Accident Health Insurance policy with all your accrued benefits after due allowances for waiting periods. Revision/ Modification of the Policy: Revision or Modification of the policy is possible at any time in future, with appropriate approval from IRDA. Withdrawal of Policy: Withdrawal of Bajaj Allianz Personal Accident Health Insurance policy is possible at any time in future with a intimation of 3 months to all the existing insured members. Cumulative Bonus/No claim bonus: You are eligible for Cumulative Bonus (CB) of 10% of sum insured for every claim free year. Maximum CB would be 50% of sum insured up to 5 claim free years. Discounts: Family discount of 10% is applicable if 2 or more family members are covered under Bajaj Allianz Personal Accident Health Insurance policy. Two Add On Covers/optional sections namely Hospital Confinement Allowance and Medical Expenses Reimbursement are also covered. Coverage of ecah section is given in below table. Death: 100% of sum assured is payable. Permanent Total Disability (PTD): 125% of the sum assured is payable. Temporary Total Disability (TTD): 1 % of the sum assured or Rs.5,000/- per week whichever is lesser. Children‘s Education Benefit: Onetime payment of Rs. 5,000/- each towards the cost of education of up to 2 of your dependent children. Hospital Confinement Allowance: If claim is accepted under Death, PTD, PPD and TTD then company will pay you Rs. 1000/- per 24 hours of hospitalization maximum upto 30 days. Medical Expenses Reimbursement: If claim is accepted under Death, PTD, PPD and TTD then company will reimburse medical expenses upto 40% of valid claim amount or actual medical bills. Suicide, attempted suicide or self inflicted injury or illness. Under the influence of drugs or liquor. Arising from the insured person(s) committing any breach of law with criminal intent. Participating as the driver, co-driver or passenger of a motor vehicle during racing or trial runs. Arising out of your participation in any naval, military or air force operations. Any curative treatments or interventions that you carry out on your body, etc. Consequential losses of any kind or your actual or alleged legal liability. Venereal or sexually transmitted diseases, HIV and/or any HIV related illness including AIDS and/or mutant derivatives or variations there of however caused. Pregnancy, resulting childbirth, miscarriage, abortion, or complications arising out of any of these. War, civil war, revolution, invasion, act of foreign enemies, Nuclear energy, radiation, etc.,. For detailed list of exclusions refer Bajaj Allianz Personal Accident Health Policy wordings and Bajaj Allianz Personal Accident Brochure. Policyholder need to fill up an ‘Application form/ proposal form’ with accurate medical history along with ‘address proof’. If you meet with an accident and injure any part of your body, you or someone claiming on your behalf must inform the company in writing immediately and in any event within 30 days. In case of death due to accident, the same must be informed to the company in writing immediately and send them a copy of post mortem report(if conducted) with in 30 days. Submit the documents within 30 days. Duly Completed Personal Accident Claim Form signed by Nominee. Attested copy of Viscera report if any(Only if Post Mortem is conducted). Claim form with NEFT details & cancelled cheque duly signed by Insured. Bonafide certificate from school / college or certificate from the educational institution. First Consultation letter from the Doctor. Hospital Bill giving detailed break up of all expense heads mentioned in the bill. Clear break ups have to be mentioned for OT Charges, Doctor’s Consultation and Visit Charges, OT Consumables, Transfusions, Room Rent, etc. Other documents as may be required by Bajaj Allianz to process the claim. You can calculate the premium using Bajaj Allianz Personal Accident insurance premium calculator. Policy period, Number of members, Age and Sum assured are required to calculate the premium. Premium differs incase of different risk levels determined by your occupation. Risk Level-I: Administrative / managing functions, accountants, lawyers, doctors, architects, teachers and similar occupations. Risk Level-II: Manual Labour, garage mechanic, machine operator, paid driver, cash carrying employee, builder, contractor, veterinary doctor and similar occupations. Risk Level-III: Workers in underground mines, electric installations with high tension supply, jockey, circus performers, big game hunters, mountaineers, professional river rafters and similar occupations. Annual Premium Rate exclusive of tax is shown in below table. For more about Income tax rate, refer www.taxqueries.in. What will be the renewal age? Under normal circumstances, lifetime renewal benefit is available under the policy except on the grounds of fraud, misrepresentation or moral hazard. When can I Increase the Sum Insured? Sum Insured Enhancement can be done only at renewals. For enhancement of sum insured, fresh proposal form along with the renewal notice should be submitted.